Ah, yard sale season: the rush of seeing your neighborhood block converted suddenly to a bazaar of rare treasures ripe for purchase! Having been to a slew of these this summer alone, I'd like take the time to offer some advice from my own shopping experiences. 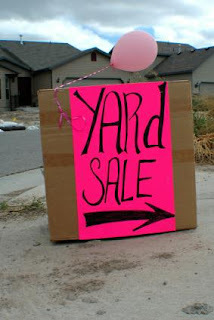 Here are my Top Five tips for yard sale shopping! Be Polite, even though this seems obvious. At a neighbor's yard sale, I remember one woman who was very rude because they didn't have enough change to break her large bills (we're talking Benjamins) because the yard sale had only just started. When they politely asked her to come back later--even offered to hold the item for her--she snapped at them as if the next words out of her mouth might be "I'd like to speak to the manager!" Her attitude was completely rude and unnecessary. You aren't at a store with items that can be restocked, you're a guest at someone's home, the items for sale are their possessions. Don't be condescending or judgmental (it makes me cringe when I hear people say aloud things like "Look at this piece of junk!" ). People like to do business with people who are friendly--and the next four tips really won't work unless you are being friendly. Ask if they're going to throw anything away. I know this may sound crazy (who wants to sort through trash at someone's garage sale? ), but people throw away plenty at big yard sales because they simply don't believe they'll sell. I've found some fabulous freebies simply because something was chipped somewhere or the paint was scratched/needed retouching. I got a set of two large gold candleholders that just needed a bit of paint for absolutely nothing. True, it could just be garbage you find in the reject pile, but oftentimes people throw out perfectly functional furniture amongst other items. I usually buy a couple items first, then politely ask if there are any items they had gone through that they were planning to just throw out. It never hurts to look! Haggle, but do so logically and respectfully. If an item is five dollars, for instance, I might try to haggle it down to two or three (depending on the condition,etc). One tactic I employ is to find a group of things I'd like to buy and offer a lower number for the set (ex: if there's a chair and a couple of lamps that would cost fifteen separate, I ask if I can have the three of them for ten). If I only have enough money for a couple of larger items, but I see something small I like (usually one of the less expensive things, perhaps a tiny objet d'art), I might ask if they'll throw the small item in as a freebie or at least discount it. The only thing to remember about these tips is to use them sparingly--aggressive haggling can come off as rude. I usually only try each method once. Make sure you have a way to transport any larger items standing by, even if you are just planning on browsing. What if you see the perfect sofa or dining room table? Perhaps a large framed work of art? If you pay for it, make sure you can get it home. When yard sale season pops up in my neighborhood, I'm often just wandering around on foot with a tote bag, but I have a family member or friend with a car standing by in case I need it. This is also helpful if the item is heavy or cumbersome. Another piece of advice that might come in handy here is to ask if they can hold the item for you once you've purchased it--that way you can come back later in the day to pick it up. If it's late in the day, they will give stuff away. When a family has a big yard sale, it's usually an effort to liquidate items they'd otherwise simply donate or throw out. As the yard sale is about to end, there is a big desire to get rid of the remaining items before the day is over. I like to go to yard sales during the final hours of the last posted day when they're having one. If I ask for discounts, I'm far more likely to get them then, but I normally don't even have to: when the sale is winding down, the hosts will ask me to take things off their hands! Maybe not big things, but the last yard sale I went to before I moved I received a ton of things for free after buying just one or two items simply because the hosts didn't want to pack them back up or haul them off. A pair of tapered candlesticks, a large decorative basket, a spice rack, a vintage blouse, a console table and a set of crystal wine goblets are just a few items I can think of that I've gotten for free this way. Now, keep in mind this one isn't a guarantee, and I would never recommend showing up and flat-out asking if they're giving stuff away, but in my experience you are far more likely to get amazing deals when the yard sale is winding down. So those are my words of wisdom when it comes to getting the bang for your buck at a local yard sale. I hope these tips and tricks are of use to you if you're in the market for used home decor items, furniture, appliances, or even if you're just browsing at a sale you stumbled upon while out for a walk. My being quite guilty of the latter (and happily so). I think yard sales are fun because every item you see has a story behind it--a grandmother's old heirloom, a table a family ate dinner at, a bed that was once a child's who is now grown--every piece was treasured by the people selling it. I like to wonder sometimes where things I've sold at yard sales now are: is a freshman excitedly bringing my old dorm decor and storage to her new home at college? Or maybe a little girl somewhere is playing on my old rocking-horse and mothering my old baby doll? Meeting with those who treasured the items face-to-face is just one reason yard sales are such gratifying secondhand shopping experiences. Anyway, hope you enjoyed this little advice post! Posted by beata-beatrixx at 8:38 AM 0 comments/comment?